Herein lies the problem. In that particular situation, being nice was not a priority. The only appropriate course of action was to lead. Yet for women, communicating in a clear and constructive way is often presented as a vice that threatens likability. Leading and being liked are presented as two mutually exclusive ideals when in reality, they are not. The consequence of this is that seemingly confident women with a natural or learned capacity to lead may harbor the irrational fear of being labeled as bossy, rude, or bitchy. As a result of this fear, the female leader may live in a world of juxtaposition. Should I remain quiet or should I speak up? How many times have I voiced my opinion thus far? Am I speaking too much? Did that sound rude? Did that come across wrong? Though it is certainly normal for a leader to reflect on and assess the manner in which they lead, for women, these thoughts may represent a constant preoccupation. 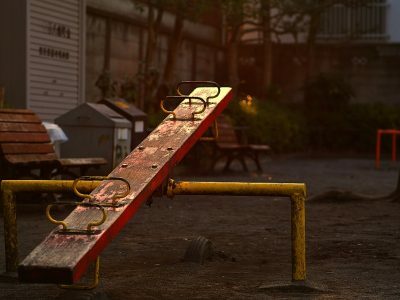 Like a huge burden on the other side of a seesaw, the possibility of being perceived as overbearing or pushy may outweigh the desire to voice one’s opinion. This burden has likely been reinforced by years of living in a society where an outspoken man is labeled as a commanding leader while a similarly outspoken woman is labelled as bossy. Though individuals of both genders avoid being perceived as rude, widespread societal and professional reinforcement may cause women to disproportionately fear being perceived as such. Because of this fear, women may be more likely to modify their leadership behavior and forgo the desire to lead and be assertive. Don’t feel the need to overcompensate. When I realized that there was nothing wrong with being a leader, I stopped trying to overcompensate for being direct or decisive. Though it has taken time, I have outgrown the urge to add exclamation points or smiley faces to emails in an effort to not seem demanding or dry. I have also stopped prefacing sentences with: “Sorry but,” “this may not make sense but…” or other apologetic clauses intended to ensure that I do not offend others. Share your experiences with other women. Sharing my experiences with my fellow graduate students, colleagues, and friends provided me with a great deal of comfort. By realizing how pervasive this issue was, it empowered me to take action and begin the process of addressing my insecurities. By sharing your experiences, you may inadvertently help others realize that it is okay to find and use their voice. Importantly, dialogue surrounding these issues need not be limited to women. Some of the most comforting and productive conversations about this topic were with my male colleague and friends. Respect your journey. For many people, the journey to find your voice may be complex and difficult. If I had tried to find a miracle cure at the beginning of graduate school or college, I likely would have been overwhelmed. By practicing to embrace leadership incrementally, I was able to make changes in my style and delivery in a way that was easy to handle. Being confident about my leadership style certainly did not happen overnight! Stay true to yourself. To me, this is the most important point. Embracing your leadership does not mean that you have to alter the subtleties or nuances of your personality. The thought that only extroverted, naturally outspoken or gregarious people can be leaders is false. In fact, there are many different types of effective leaders. The female leader is a collective of diverse people with different styles and approaches. Thus, even if you are naturally introverted or quiet, remember that you can still find your voice and lead effectively within the confines of your natural personality. The goal is not about becoming someone that you are not – but rather, embracing your unique style of leadership – whatever form that may be. The take home message is that you do not have to sacrifice leadership for likeability – these two concepts are not mutually exclusive. My advice to all women out there is this: Do not be afraid to take charge, make a decision, point out a flaw, suggest a better alternative, point out a gap in a plan, or decisively make a choice. Push forward, lead even stronger, and never, ever undercut your skills simply because it challenges the conventional notion of a leader. Though it can be a journey, it is certainly a process worth undertaking.